In 1869, an agreement was made between a group of Shawnees and the Cherokee Nation. 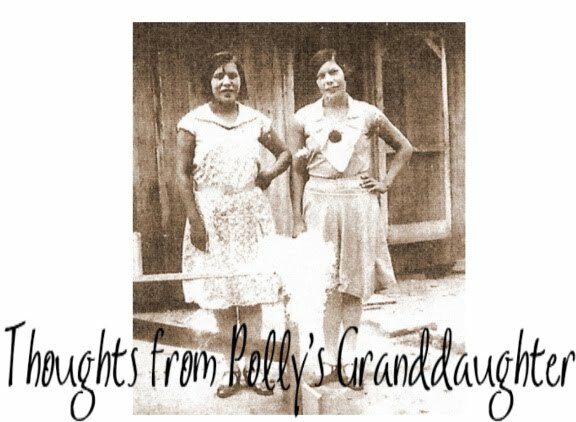 Under that agreement, "the said Shawnees shall be incorporated into and ever after remain part of the Cherokee Nation, on equal terms in every respect, and with all the privileges and immunities of native citizens of the said Cherokee Nation;..." [emphasis mine] Years later, those Shawnees and their descendants were included in the Cherokee Nation citizenry and listed on the Final Dawes Rolls as Cherokee by blood. 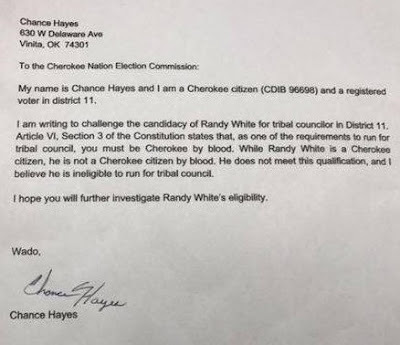 Randy White, a citizen of the Cherokee Nation who descends from Rebecca Rogers, an adopted Shawnee (Dawes Cherokee by blood #27575) and Thomas White, an adopted Shawnee/Delaware (Dawes Cherokee by blood #10293) , filed to run for a seat on the Cherokee Nation tribal council. His eligibility to run for council was then challenged based on the incorrect assumption that our Constitution requires all candidates to be "Cherokee by blood." The Constitution does not require candidates to be "Cherokee by blood". Instead, it requires candidates to be a "citizen by blood." 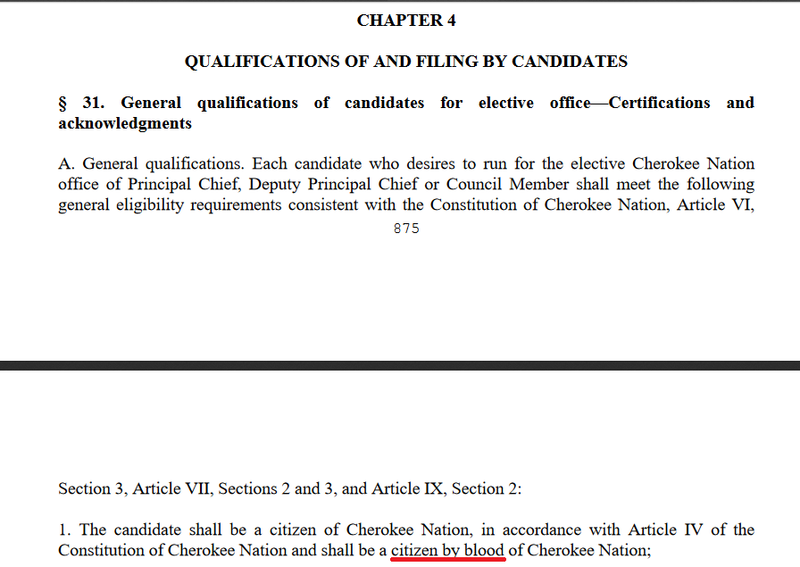 Section 31.A.1 of Title 26 of the Cherokee Nation Code Annotated also requires a candidate be a "citizen by blood." Based on those sections of our Constitution and Election Law (despite the fact neither say one must be "Cherokee by blood" to run for council) along with the nearly eleven year old Lucy Allen case decision, the Election Commission ruled Randy White is not eligible to run for council because he is not "Cherokee by blood." According to an article in the Cherokee Phoenix, there was a great deal of emphasis put on the decision made in the Lucy Allen case, but there was no mention of another important section of our CURRENT law. That section of our law is critical in the evaluation of the term "citizen by blood". It says in order to file to run for office, a person must show proof of "citizenship by INDIAN blood". The requirements to run for tribal council are plainly stated in the current Election Law. There is no reason to go back to a previous court decision (the Lucy Allen decision) when our current law answers the question posed to the Election Commission. 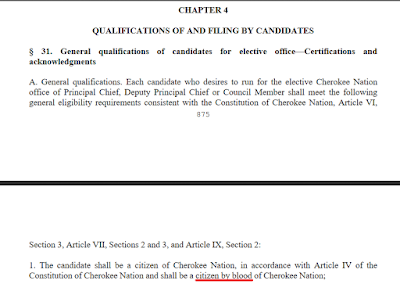 The law says a person must show proof of Indian blood and be a citizen of the Cherokee Nation to run for an elective office. Randy White followed the law. Nowhere in that law does it say he had to show proof of citizenship by "Cherokee" blood. Instead, it says he had to show proof of citizenship by Indian blood. He did that. I'm no lawyer, but it seems clear that he is eligible to run for tribal council. 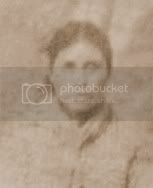 If the founders intended for the Constitution to require people to be "Cherokee by blood" in order to run for tribal council, they would have said it. They did not say it. If the tribal council intended for the law to say a candidate had to show proof of citizenship by "Cherokee blood", they would have said it. They did not say it. The simple language of the law says any Indian citizen of the Cherokee Nation can run for tribal council. Despite the fact most of us are not District 11 voters, are not of Shawnee descent, and do not know Randy White, we should all be concerned about protecting his legal right to run for tribal council. This is about something bigger than one district, a lineage, and who we know. This is about ensuring that we have a fair election that follows our laws and without the perception of impropriety. Randy White plans to file an appeal on Monday morning. This case will go to the Cherokee Nation Supreme Court. Hopefully the Court will carefully review the information and make a fair and just decision based on the current laws of the Cherokee Nation.